Let me tell you a little story. Alan and I had only been in Pennsylvania for a few days, didn't know anyone or where anything was and he developed kidney stones. I came home from a job interview to him writhing in pain and not knowing what was going on. I was terrified that he was having an appendicitis or something and in the process of trying to find the nearest hospital on my phone, wound up rear ending the car in front of me. Luckily it was stop and go traffic and no harm was done to us or the vehicles. Or what about the time Alan and I were sitting in the car in a parking lot at the movie theater and a girl hit us pulling into her spot because she was texting - she actually had no idea she had hit my car until I got out and started inspecting it because she was looking at her phone the entire time. Or, when I was a sophomore in high school driving home from taking the SAT. I looked down for a second to sneeze and in that split second wound up rear ending the person in front of me who had stopped to turn. Most people think of cell phone usage when they think of a distracted driver. 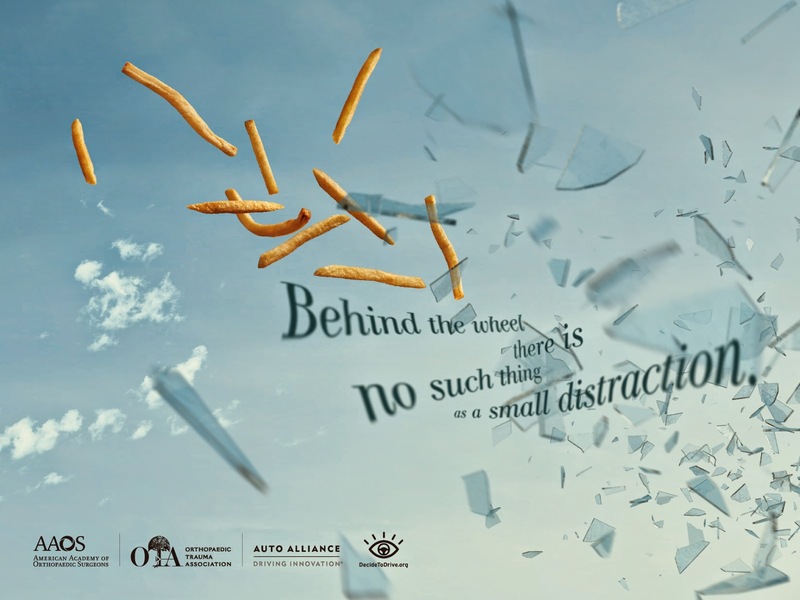 But, anything that takes your attention away from the task at hand is an example of distracted driving. This could be your kids, eating, Starbucks, messing with the radio, you name it. I can't tell you the number of times I would drive my stick shift in college with my phone in one hand and a Starbucks in the other..definitely not the example I want to set for my children today. I recently got a new car that has bluetooth and have definitely taken advantage of this feature already. The American Academy of Orthopaedic Surgeons and the Auto Alliance want to increase awareness about the risks of distracted driving. Did you know that according to the National Highway Traffic Safety Administration (NHTSA), of the nearly 33,000 roadway fatalities in 2012, there were 3,328 fatalities and approximately 421,000 injuries in distracted driving-related crashes. Orthopaedic surgeons, you know, the specialists who put bones and limbs back together after road crashes and traumas, along with automakers, would rather help all drivers "decide to drive" each time they get in the car and to keep bones and limbs intact. The Decide to Drive program aims to empower drivers and passengers to speak up about distracted driving, continue the conversation at home, work and play, and reduce distracted behaviors behind the wheel. The most advanced safety feature of any vehicle is the driver. The AAOS and the Auto Alliance are urging drivers to keep their most sophisticated safety features engaged at all times: eyes on the road and hands on the wheel. The #DecidetoDrive campaign is looking for a catchphrase to alert a driver that they are distracted. What would you like to see on social media, bumper stickers, posters, logos, campaign materials, etc.? They're looking for something creative, funny, clever or just simply powerful that will “drive” the message home. Please submit your idea here. The campaign catchphrase should be simple and to the point, short enough to fit in a small website badge; perfect for a bumper sticker. Winners will be selected by a panel of judges based on quality - this is not a random drawing! Top prize is a $1,000 Visa Gift Card (and the potential of having your idea featured prominently in a nationwide Decide to Drive campaign! ); two runners-up will receive $500 Visa Gift Cards. Wow...I finally got to read this and the texting girl- wow! to not realize she hit someone? eesh. Not as funny but a girl of similar age rear ended me, got out and said "sorry, I forgot to brake," then when we got back on the road she cut me off. classy. Nice. It's scary how clueless people can be! We had several scary moments on our drive for vacation. A few years ago within a time span of 6 months, I was rear ended while sitting at stop lights by two people who were looking at their phones and/or texting..... I was beginning to feel like I had a target on my bumper. What Do You Have in Your Backyard? So Glad It's the Weekend!